Capsicum is known to have warming strength. Numerous scientific studies suggest that capsicum can stimulate blood flow and provide digestive and circulatory support. Beneficial bioactive components of the capsicum are the content of flavanoids. Other important bioactive compounds contained in the capsicum are alkaloids and tannins. Though in lesser concentrations than vitamin C and vitamin A, these are showing potential in providing health benefits when consumed. 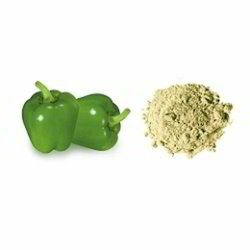 With immense market knowledge, we have been able to provide optimum quality Dried Capsicum Powder.